Will Hodgman at Willow Court today. 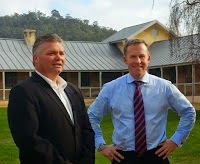 PREMIER Will Hodgman was today given a personal tour of the council-owned section of the Willow Court historic site by Derwent Valley mayor Martyn Evans. As he had been unable to attend a preview for parliamentarians three weeks ago, Councillor Evans took advantage of Mr Hodgman's presence in New Norfolk today to update the premier on recent conservation works at the site. 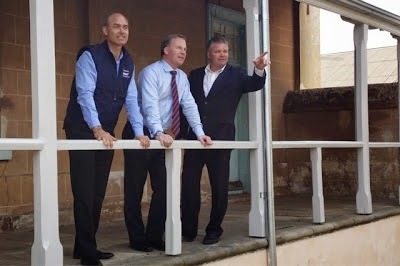 Cr Evans said the premier seemed impressed with the progress and had undertaken to seek advice on continuing the State Government's contribution to the cost of the project officer who has been managing the conservation works over the last 18 months. The new lawn in front of the barracks is taking shape and works are continuing on the redevelopment of Bronte House as a visitor centre. Evans at Willow Court today.